I love Fall! I especially love the pumpkin and candy corn mixed bags that are showing up on the shelves at Target and the grocery store. Yesterday when we were shopping my oldest two kiddos convinced me that we needed some pumpkin candies for math games. We hurried home and they couldn't wait to get started playing! 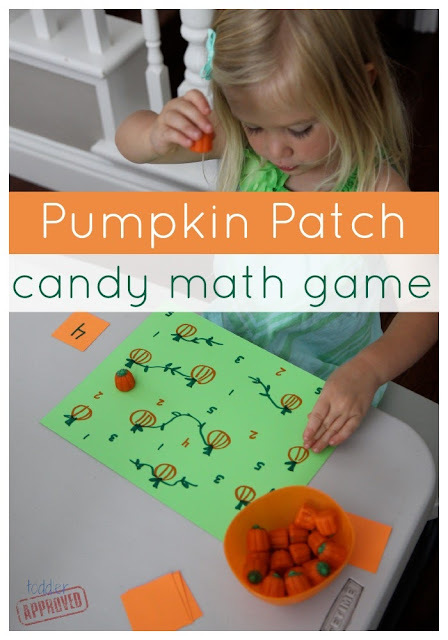 We created two different pumpkin patch themed candy math games using our pumpkin candies! The first one that I am sharing today helped us practice number recognition! My daughter is almost three and loves numbers! She is currently learning to recognize numbers 1-5. We love to explore numbers in fun and playful ways. To get us started I created a pumpkin patch mat using markers and a piece of cardstock. I drew several pumpkins and then wrote numbers 1-5 several times all over the paper. Then I cut out several 2x3 pieces of cardstock and wrote a number on each piece (1-5). To play this game we made a pile of our number cards with the number facing down on the table. To start, my daughter flipped one card over and looked at the number. If she wasn't sure which number it was, I told her. Next, she looked for numbers that matched her number card on her pumpkin patch paper. Each time she found a matching number she put a pumpkin candy on top of it. Once all of one number were covered with pumpkin candies, she ate a pumpkin, put the rest back in her bowl... and turned over a new number card. We played again and again as we practiced identifying numbers 1-5... and eating some treats along the way. To make this more difficult you could use harder numbers. 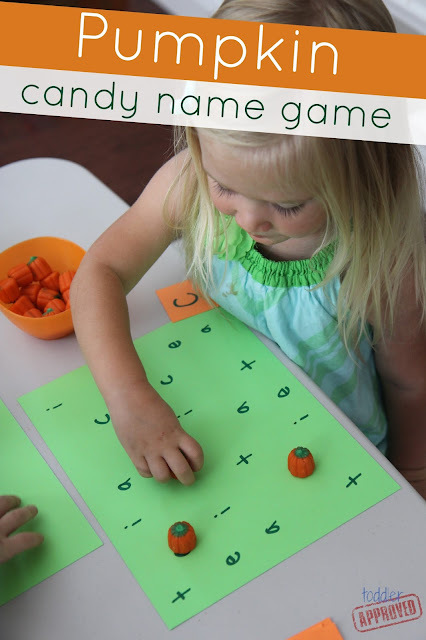 When we were done, we flipped over the pumpkin patch paper and number cards and wrote down the letters in her name instead... and created a simple Pumpkin candy name game. She used the same technique from the candy math game to practice identifying the alphabet letters in her first name. We have another simple pumpkin activity we'll be sharing next week that was a big hit with my 5-year-old son! Do you have any favorite Fall or pumpkin themed activities that use candy? I have done something like this before and seeing your post helped me remember. Thanks so much for sharing the things you do! This is fantastic! I am going to have to try it with my youngest. Thanks for sharing on After School Linky! I am featuring it this week! Love this! I'm featuring it too!